Innovative ideas are often born in California. This is the home of Silicon Valley, after all. But, that spirit of innovation isn’t limited to finding more ways to plug in to the world of high tech. Innovation also means finding ways to disconnect from it all. This kind of innovation is taking place in three San Francisco public schools that have started school-wide meditation programs. The hope is that a little quiet time and mindfulness will help facilitate learning. It’s all paid for with private money, and one school says it’s seeing results. Natalie Jones reports on how it works. NATALIE JONES: Middle schools do not tend to be quiet places. For many people, middle school is hard enough in the best of circumstances. For students growing up in rough neighborhoods or dealing with difficult family issues, it can be especially stressful. That’s why four years ago, James Dierke, principal of Visitacion Valley Middle School in San Francisco, decided to implement a meditation program for the entire school to see if it would help students and teachers deal with stress and focus on schoolwork. JAMES DIERKE: There’s individual stresses of just being a teenager, there’s family stress, there’s community stress, and all those things multiply within a person. So this is something that everyone can do and doesn’t require a tremendous amount of effort on their part but has great results. The program is called Quiet Time, and it teachers students the practice of Transcendental Meditation. PA SYSTEM ANNOUNCEMENT: Please excuse this interruption, teachers and students, please prepare for Quiet Time, please prepare for Quiet Time. Mr. Tagaloa’s homeroom is getting ready for the morning meditation session – they do fifteen minutes at the beginning of their school day, and fifteen minutes at the end. VAO TAGALOA: Going to start our Quiet Time, let’s start by sitting up straight…close the eyes….let’s enjoy. The dozen or so 8th graders in the room turn to face front, shut their eyes, and stay that way for a full fifteen minutes, without breaking the silence or fidgeting. Visitacion Valley is one of the more challenged schools in the district – about two thirds of its students were getting free or reduced lunch last year, and the percentage of students proficient in basic subjects is lower than both the district-wide and the state-wide percentage. In the last three months alone, there have been two homicides and more than a hundred assaults within just a mile radius of the school. Principal Dierke compares growing up in the neighborhood to living a war zone. DIERKE: A lot of our kids come down with post-traumatic stress, just like you would if you lived in Iraq. So it’s hard to turn that off when you come in the school building when you sit down and try to study. Post-traumatic stress is a hard thing to combat, but there are signs that Quiet Time is effective. Since the program started, test scores have gone up a little bit, attendance rates have gone up a little bit, and suspension rates have gone down, although the changes are only by a few percentage points. Most of the evidence of the program is anecdotal. Students and teachers participate willingly and say it’s helpful for them, and surveys that school has done return positive feedback. Though not everyone was enthusiastic at the beginning. Tristan is an 8th-grader, and has been doing meditation at school since 6th grade. TRISTAN: But when I started to get into it and started to do it every day I noticed that it really helped me because I was sort of a trouble child, and then when I started to meditate I started to become a leader, I got good grades, so it was really helpful. Students do have the option of doing something else quiet, such as reading, but Principal Dierke says only a few have chosen to do that. He’s also had strong support from parents. DIERKE: In the last four years that we’ve been involved in this, I haven’t had one negative parent complaint. The program, which for this school year costs about $175,000, is funded almost exclusively by the David Lynch Foundation, an organization set up by the filmmaker David Lynch, who’s known for surreal films such as Mulholland Drive and the TV series Twin Peaks. The organization’s goal is to provide Transcendental Meditation in schools and communities that could benefit from stress reduction. The rest of the funds come from private donations, which pay for 3.5 full time staff members who are trained to teach meditation. They spend their time teaching new students, helping returning students remember how to use the method, and training the teachers. Two other schools in San Francisco are also trying the program – Everett Middle School and John O’Connell High School. They haven’t been doing it as long as Visitacion Valley, but they’re all hoping that meditation can create a refuge for students who wouldn’t otherwise have one. For Crosscurrents, I’m Natalie Jones. Natalie Jones is a reporter with the UC Berkeley Graduate School of Journalism. So, what do you think about meditation for school kids? Would you be behind that? Let us know at 415-264-7106, or send us an email. Also mentioned on sfist: David Lynch Helps S.F. 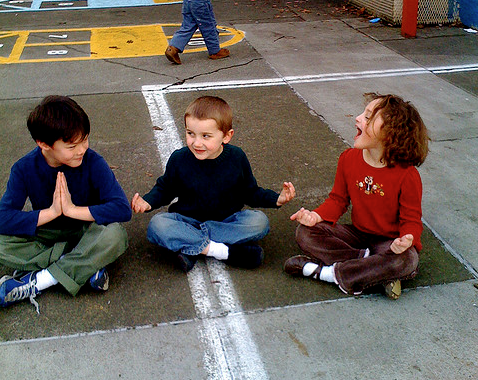 Schools Meditate, and in SCOPE, Stanford School of Medicine, under Alternative Medicine: Meditation in the classroom: Program helps at-risk kids. And here’s a wonderful report from the The George Lucas Educational Foundation (GLEF): Edutopia: SF School Uses TM to Overcome Problems. This entry was posted on February 12, 2011 at 12:50 am and is filed under Articles, David Lynch Foundation, Education. You can follow any responses to this entry through the RSS 2.0 feed. You can leave a response, or trackback from your own site.